years old today. I sorted and organized my tackle and lures, most of which were his at one time. During his sickness, he started giving his outdoor stuff away to family and friends. I got his musky fishing tackle, and Paul and Tom were given his ice fishing equipment. It makes this time of year bitter sweet for me. A couple of weeks after I received the tackle box, I remember looking in one of the pockets and finding a map for the BWCA for an area we frequented. It caused one of those blindsided moments of grief where I was glad no one was around. Somehow knowing that he'd used the map twenty some years ago was just too much to take. When I can, I like to pack a backup reel for this trip, in case something should happen to my main one. So I grabbed the one Rob gave me and, well, there he was again. This reel gave me some problems when I tried it out a few years ago, so I had it serviced in hopes I could salvage it. Seeing it again reminded me of the first time he used it up at the cabin in Mercer. He was new to the "bait caster" reels that require a great amount of practice to perfect. Wildly different than a "spinning reel" these spool off line at a fast rate, so you have to stop the spool from spinning when the lure hits the water. Well, while fishing with Paul on his first or second cast, he got a first rate rats nest. I remember the litany of colorful metaphors used to express his surprise and displeasure that the "brand new" reel had caused him. The same thing happened to me the first time I used a bait caster. While I packed, I recounted each of the five muskies I have to my credit. Two of the five have immediate ties to Rob. One I caught on his birthday a couple of months after he passed away in 2011. The other I caught on the 2nd anniversary of his death, August 30th, 2013. But of those two, the birthday one meant the most. Rain, wind, tough conditions and a fishing buddy who understood what it meant to me to catch a fish that day made it unforgettable. Steve surrendered what we agreed was to have been his fish, because it didn't feel right for him to take it. Thankfully, within a half hour, he caught one himself, a nice tiger muskie. A day full of God moments. And so as I finalize the details of food, beer and clothing for the trip I think back on one of the few regrets I have in life. I wish we had found a way to get Rob up to Musky Fest (as I like to call it) in October. 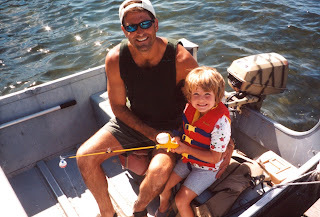 He was always "fishing for an invite," but it seemed we never really had room in the boat. Had I known things would happen the way they did, I would have found a way to get him there. This is not to say we didn't have a ton of other adventures together, because we did. The BWCA, the cabin, our family trips together and much more. Our kids are tight with his girls in large part because we made an effort to be together and to teach our kids to love the outdoors. But when someone's gone sometimes all you see is what you didn't do together. I guess I'll just have live with it. It's my hope, as it is every year, to come away with at least one musky to my credit. While it won't happen on his birthday this year, in using his equipment, I'll know he's still there cheering me on in spirit. And Steve and I will toast him and Steve's deceased brother Pete who passed away a few months before Rob, just the same.